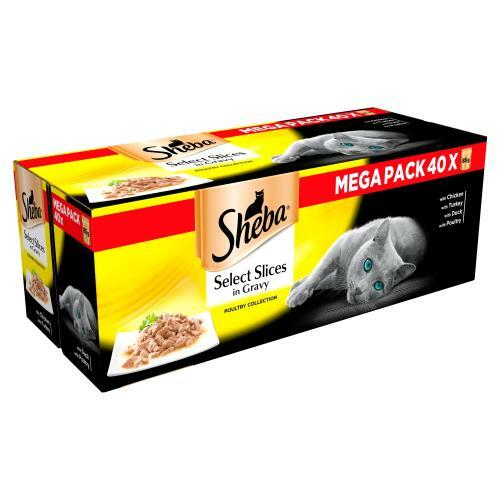 Sheba Select Slices Poultry Collection is a deluxe medley of succulent pieces in decadent gravy. Sheba understands your felines need for high quality food and has produced this well-crafted recipe, it’s sure to keep your feline friend purring and pawing for more! With Chicken: Meat and Animal Derivatives (44%, including 4% Chicken), Cereals, Minerals, Various Sugars. With Turkey: Meat and Animal Derivatives (44%, including 4% Turkey), Cereals, Minerals, Various Sugars. With Duck: Meat and Animal Derivatives (44%, including 4% Duck), Cereals, Minerals, Various Sugars. With Poultry: Meat and Animal Derivatives (44%, including 4% Poultry), Cereals, Minerals, Various Sugars. Analytical Constituents: Protein 8.5%, Fat Content 4.5%, Inorganic Matter 2%, Crude Fibres 0.3%, Moisture 82%.